My all time favorite pasta dish is Orecchiette with Brocolli Rabe & Pork Sausage. I’m pretty sure I could eat that every single night with some red pepper flakes tossed in for good measure. Add a glass of wine and I’m set for life with that regimen. But, I don’t want to be filled with pasta and pork sausage all the time. This recipe is a way to get that robust flavor without using lots of fat. The anchovies give it depth, the wine brightens it up, and you can feel good eating plenty of greens. 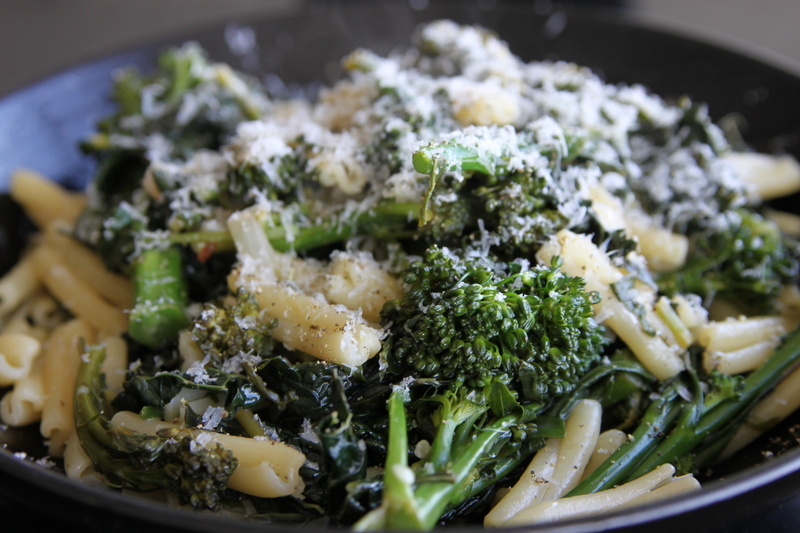 Sometimes I make this with so many greens that the pasta becomes the second fiddle. Any sort of greens will work with this: conventional broccoli, various types of kale, even spinach. So, feel free to replace the below with what greens are available. Make sure you use a mix though–you want some bitter, some more tender, and different textures. Just make sure you have some good parmesan to finish it off. I always use Tuscan Kale for this. 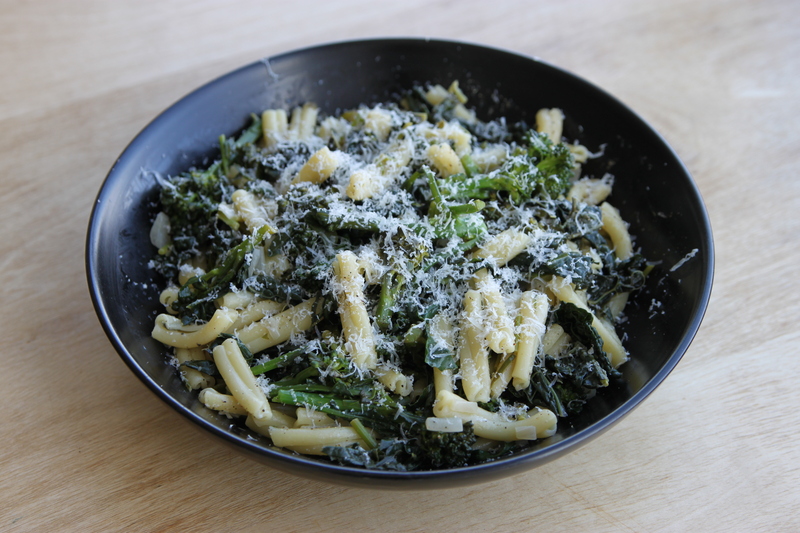 Some call it lacinato, others dino kale, and others cavolo nero. Regardless, it’s in my opinion the most tender of kales. Spring Rabe was available at the farmers market so I incorporated that. Here is the Stridolo. 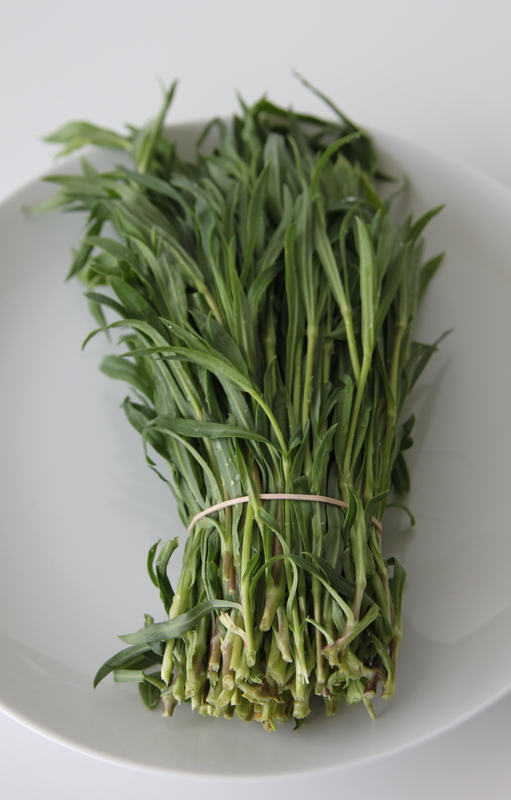 Stridolo, also called Sculpit, tastes like a more herbal chicory. If you can find it, you must try it. A lot of nurseries are starting to carry it here in the states–you also can order seeds directly from Italy online. The leaves are super tender! 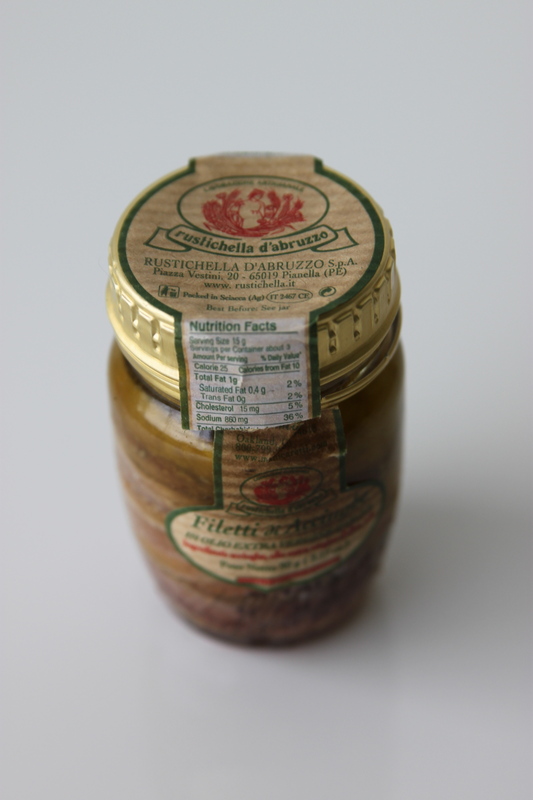 Make sure you are using anchovies in olive oil. This is my favorite brand–it’s relatively pricey at 11 bucks a jar but they are by far the best I have found! Using a bit of the pasta water was a revelation for me. It really pulls it together, especially with a relatively spartan pasta like this one. It has starch in it which thickens the vegetable sauce. It’s a miracle ingredient so start using it. Top with plenty of parmesan and fresh ground pepper. I like this with a glass of cold white wine on a hot day. Eating outside is preferable! 1) Wash the kale, stridolo and spring rabe. 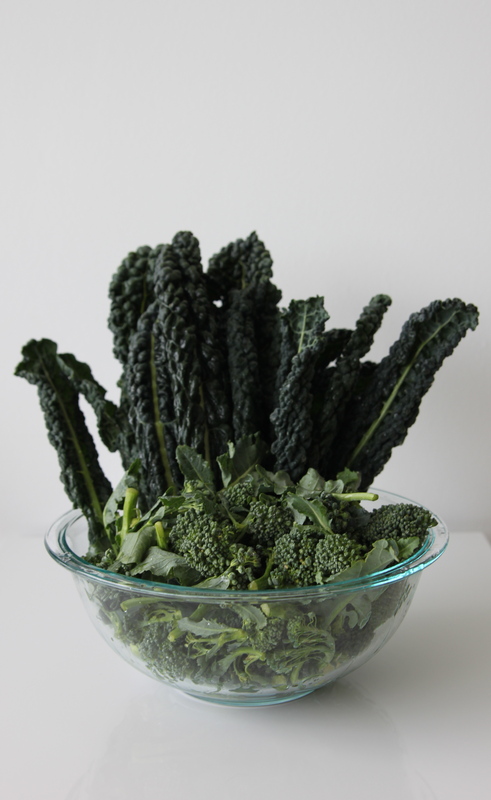 Once dry, remove the leafy portions of the kale from the hard bitter stems. Then chop into strips. Chop the stridolo into pieces approximately 2 inches long. Chop the spring rabe into bite sized pieces. Place the greens to the side in one large mixing bowl. 2) Remove garlic cloves from the bulb. Give them a gentle smash but keep them intact. Chop shallots into small pieces. 3) Put a large pot of water on your stove and turn heat to high. Bring water to a boil. 4) Place a large french oven on medium heat. Add approximately 1 Tbsp. of olive oil. Once olive oil is hot, add anchovies. Then add shallots and garlic. Stir vigorously until anchovies have dissolved and there is a light brown residue at the bottom of your pan. This takes approximately 5 minutes. The shallots should have softened by now. 5) Turn heat to medium-high. Then, add the white wine to deglaze the pot. You want to break up all the residue at the bottom of the pot. That is where the flavor is! 6) Once some of the white wine has cooked off (do this for about 2 minutes) add all the greens along with a small glug of olive oil. Then add red pepper flakes to taste. I like mine to have a bit of a kick. Toss and stir greens so that they cook evenly. It will take about 8 minutes to cook the greens. 7) While greens are cooking, add dry pasta to the boiling water. Follow your box’s direction. However, I always cook my pasta for about 1 1/2 minutes less than the box recommends. You want this to be al dente–and, keep in mind that the pasta is going to go into a hot french oven with hot greens so you want some room for the pasta to continue to cook. Cook pasta for approximately 8 minutes while stirring occasionally. 8) Using a measuring cup, remove 1/2 cup of the boiling pasta water. Place to the side. Then, remove pasta from stove and strain in a colander. Remove greens from the stove. 9) Immediately place the strained pasta into the french oven holding the greens and top with 1/2 cup of hot pasta water. Toss and mix well. 10) Serve. Top with fresh ground pepper and grated parmesan. Some also like a squeeze of lemon but that is up to you.